Federal Polytechnic Nekede (NEKEDEPOLY) National Diploma (ND) Morning (Regular), Evening and Weekend (Part-Time) Acceptance Fee and Payment Guidelines and Deadline for Freshers/Newly Admitted Students 2018/2019 Academic Session. 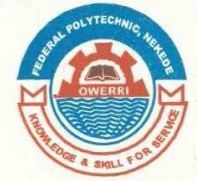 The Management of the Federal Polytechnic Nekede (NEKEDEPOLY) wishes to inform all National Diploma (ND) morning (regular), evening and weekend programmes applicants who has been admitted that they can now commence the process of admission offer and acceptance fee payment for 2018/2019 academic session. All admitted candidates will be required to pay a non-refundable sum of #20, 000 (Twenty Thousand Naira) on E-Tranzact Platform at Federal Polytechnic Microfinance Bank within two weeks or have the admission forfeited. For further details on payment procedures/process, log unto http://ndapplication.fpno.edu.ng/Applicant/Admission/CheckStatus. You should proceed with your documents to the Director where you will be issued with Registration materials and authorization paper to pay school fees. Registration must be completed within one month of acceptance of offer of the admission. The admission lapses upon non compliance with this time duration. Deadline for payment of acceptance fee is 24th September, 2018.